Frontispiece of Alexandru Odobescu's Trésor de Petroasa (1889), by Henri Trenk. The Pietroasele Treasure (or the Petrossa Treasure) found in Pietroasele, Buzău, Romania, in 1837, is a late fourth-century Gothic treasure that included some twenty-two objects of gold, among the most famous examples of the polychrome style of Migration Period art. Of the twenty-two pieces, only twelve have survived, conserved at the National Museum of Romanian History, in Bucharest: a large eagle-headed fibula and three smaller ones encrusted with semi-precious stones; a patera, or round sacrificial dish, modelled with Orphic figures  surrounding a seated three-dimensional goddess in the center; a twelve-sided cup, a ring with a Gothic runic inscription, a large tray, two other necklaces and a pitcher. Their multiple styles, in which Han Chinese styles have been noted in the belt buckles, Hellenistic styles in the golden bowls, Sasanian motifs in the baskets, and Germanic fashions in the fibulae, are characteristic of the cosmopolitan outlook of the Cernjachov culture in a region without defined topographic confines. 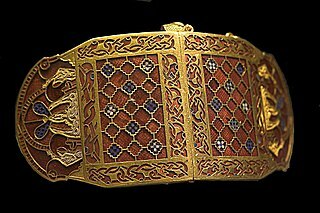 When Alexandru Odobescu published his book on the treasure, he considered that such magnificent work could only have belonged to Athanaric (died 381), leader of the Thervings, a Gothic people. Modern archaeologists cannot connect the hoard with such a glamorous name. The treasure was shipped to Russia in December 1916, as German armies advanced through Romania in World War I, and was not returned until 1956. An atomic analysis of the Pietroasele gold hoard has concluded that from the point of view of Ir/Au, Cu/Au and Ag/Au concentrations the three styles are clustered. At least from the iridium concentration data, the assumption of a Dacian provenance of the hoard raw material is highly improbable as also the hypothesis that Roman imperial gold coins were used for manufacturing Pietroasa artifacts is not in accordance with the elemental concentrations. ^ Campbell, Joseph. The Masks of God: Creative Mythology. 1968. ^ Odobescu, Alexandru, Le Trésor de Petrossa, Paris, 1889-1900. Wikimedia Commons has media related to Pietroasele treasure. The National Bank of Romania is the central bank of Romania and was established in April 1880. Its headquarters are located in the capital city of Bucharest. Pietroasele is a commune in Buzău County, Romania, known for its vineyards. The name means "the rockies". The commune is composed of six villages: Câlțești, Clondiru de Sus, Dara, Pietroasa Mică, Pietroasele and Șarânga. 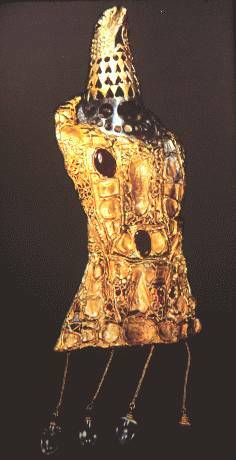 It became famous with the discovery in 1837 of the Pietroasa Treasure composed of several pieces of gold and precious stones. The Romanian historian Alexandru Odobescu wrote a book on the archaeological discovery. The Ring of Pietroassa is a gold torc-like necklace found in a ring barrow in Pietroassa, Buzău County, southern Romania, in 1837. It formed part of a large gold hoard dated to between 250 and 400 CE. The ring itself is generally assumed to be of Roman-Mediterranean origin, and features a Gothic language inscription in the Elder Futhark runic alphabet. Alexandru Ioan Odobescu was a Romanian author, archaeologist and politician. In 1966 the Fishpool Hoard of 1,237 15th century gold coins, four rings and four other pieces of jewellery, and two lengths of gold chain was discovered by workmen on a building site near present-day Cambourne Gardens, in Ravenshead, Nottinghamshire, England, an area that was then known as "Fishpool". 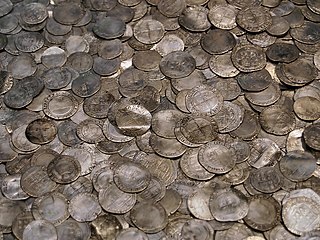 It is the largest hoard of medieval coins ever found in Britain. To judge from the dates of the coins, the hoard was probably buried in haste at some time between winter 1463 and summer 1464, perhaps by someone fleeing south after the Battle of Hexham in May 1464, in the first stages of England's civil war between aristocratic factions, the War of the Roses. The Fishpool Hoard, on display in Room 40 in the British Museum, London, was listed in 2003 among Our Top Ten Treasures, a special episode of BBC Television series Meet the Ancestors that profiled the ten most important treasures ever unearthed in Britain as voted by a panel of experts from the British Museum. The British Museum assesses the face value of the hoard when deposited, about £400, would be equivalent to around £300,000 today.